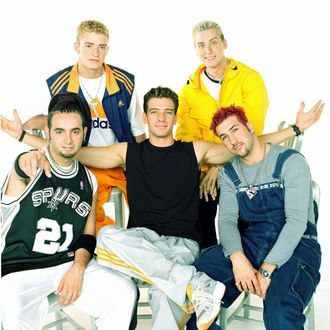 With last year’s NKOTBSB tour (that’s New Kids on the Block and Backstreet Boys) still fresh in our minds, we finally might be getting the ’N Sync reunion we really wanted all along. MTV has announced that along with receiving the Video Vanguard Award, Justin Timberlake will be joined onstage by his former bandmates (that’s JC Chasez, Lance Bass, Joey Fatone, and Chris Kirkpatrick) for a “reunion performance.” Whether that’s a quick harmonizing of the “Bye Bye Bye” chorus, or putting back on the puppet strings, we cannot tell you, but one thing is for sure: ’N Sync’s “sixth member,” Lou Pearlman, will not be invited (or released from jail) to the reunion. UPDATE: Turns out this rumor might not be true. On his SirusXM show, Lance Bass explained that some of the boys were in Miami together to see Justin and Jay Z’s last stadium show and Page Six might have mistaken that for an upcoming reunion.